When selecting air barrier products to employ in building designs, architects have a broad range of choices. 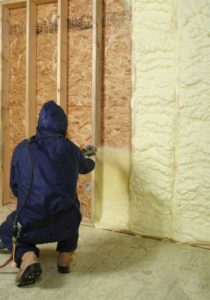 Spray foam insulation products are often selected because they can provide superior performance and also contribute to greater energy and operating cost savings in buildings. In particular, closed-cell (medium-density) and open-cell (low-density) spray applied polyurethane foam (SPF) can insulate and air seal wall assemblies in commercial buildings quite effectively, economically, and efficiently. Their air-sealing characteristics, along with the ability to minimize moisture and temperature-related issues, and capacity to enhance the performance of a wide variety of building types make them ideal for commercial projects. At the same time, more design freedom is realized due to the custom, field-applied nature of the system. As a result, these products are becoming a popular alternative among architects when designing exterior walls for airtight construction. The need for air barriers in exterior walls is well understood in the building community. Effective air barriers have positive impacts not only on heating and cooling energy costs, but also on moisture problems, indoor air quality (IAQ), and acoustics. This is because moving air can carry unwanted moisture, contaminants, or noise into a building. Overall, proper sealing with an air barrier system results in more sustainable and durable buildings addressing numerous green design issues, such as efficient use of construction resources. There is a realization among the design community an air barrier system is a combination of components within the building enclosure, which typically includes a primary air barrier material. The system components are designed, installed, and integrated in such a manner as to stop the uncontrolled flow of air into and out of the building enclosure. 0.02 L/(s·m²) (0.004 cfm/sf) when tested at an air pressure of 75 Pa (1.57 psf). The testing basis for this rating is ASTM E2178, Standard Test Method for Air Permeance of Building Materials. Closed-cell, medium-density, SPF products are required to have this testing conducted to meet the requirements of the Underwriters Laboratories of Canada (CAN/ULC) S705.1-01, Standard for Thermal Insulation–Spray Applied Rigid Polyurethane Foam, Medium Density–Material–Specification. 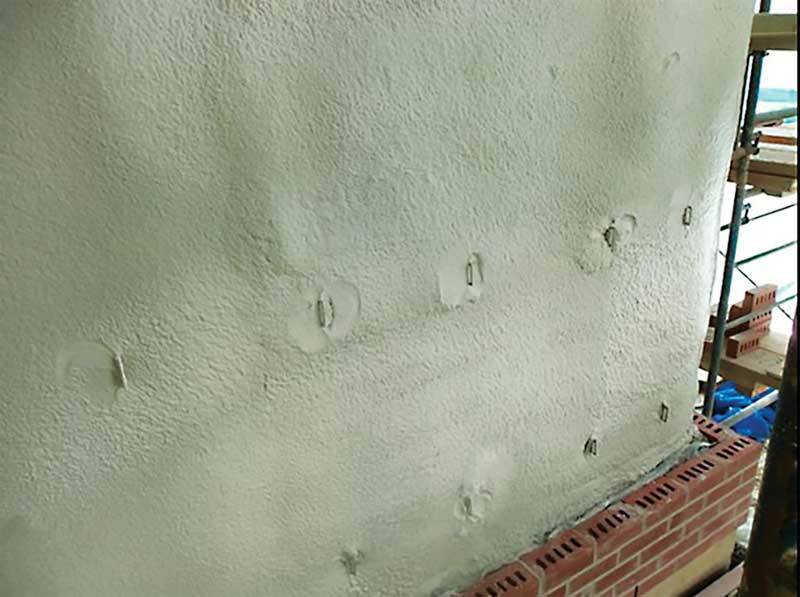 In this exterior wall, medium-density spray foam completely seals around brick ties and other attachments for their full depth, thereby ensuring airtight performance. The air seal with spray-applied polyurethane foam (SPF) is continuous, immediate, and solid. In the American National Standards Institute/American Society of Heating, Refrigerating and Air-conditioning Engineers/Illuminating Engineering Society of North America (ANSI/ASHRAE/IESNA) 90.1, Energy Standard for Buildings Except Low-rise Residential Buildings, both SPF product types are recognized as air barrier materials. Manufacturers should be consulted for ASTM E2178 test results that indicate the thickness of a specific product for it to qualify as an air barrier material. The Canadian Construction Materials Centre (CCMC) has developed a Technical Guide for Air Barrier Materials describing the criteria for the assessment of mechanical and physical properties of air barrier systems for exterior walls of low-rise buildings for the purpose of obtaining a CCMC Evaluation Report. Although low- and medium-density SPF products are eligible to apply for a CCMC Air Barrier Systems Report, currently just a small number of medium-density SPF products have obtained it and only for exterior continuous insulation (ci) wall applications. be buildable in the field. A significant installation benefit of medium-density spray foam insulation is its ability to conform directly to the wall (sheathing or structural) surface regardless of shape, geometry, or irregularities. It can be employed on the exterior or interior side of a wall and fully covers and seals the underlying construction to provide a continuous, uninterrupted insulation layer. Curved buildings, for example, have traditionally needed a very labour-intensive process where rigid foam boards had be cut to shape and then excessively taped at each joint. 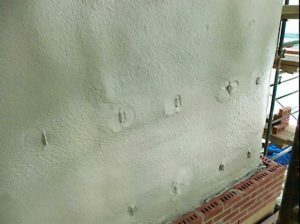 This can now be replaced with a quick, smooth, and far less labour-intensive installation of spray foam. a water-resistive barrier (WRB) since it is capable of shedding water (when SPF is integrated with flashings around penetrations and key wall transition points a durable water-resistant system is formed).